Kalamazoo, MI November 4, 2016 – The Kalamazoo Symphony Orchestra, conducted by Music Director Raymond Harvey, presents internationally renowned Principal harpist of the Metropolitan Opera House, Emmanuel Ceysson, for the third concert of its 2016-17 Symphonic Series. Billed the "enfant terrible" of the harp, Ceysson's virtuosity and infectious enthusiasm will be on full display in Glière's Harp Concerto. Maestro Harvey rounds out the program with the music of Pulitzer Prize winning composer John Corigliano and Felix Mendelssohn. Corigliano's Voyage from 1978 is a string orchestra setting of Baudelaire's "L'invitation au voyage." Felix Mendelssohn wrote his Symphony No. 3 "Scottish" after a walking tour of Scotland. 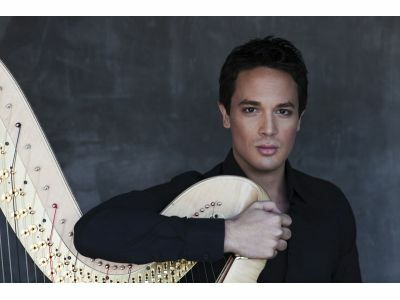 Emmanuel Ceysson is one of the world’s leading harpists. He has recently started his new job as Principal harp at the Metropolitan Opera House in New York, after a successful career at Opera de Paris lasting 9 years. Since 2005 he has been a presence in such leading venues on the international musical scene as the Wigmore Hall, the Salle Gaveau, Carnegie Hall, the Vienna Konzerthaus, and the Berlin Philharmonie. He won the Gold Medal and a special performance prize at the USA International Harp Competition (Bloomington) in 2004, First Prize and six special prizes at the New York Young Concert Artist Auditions in 2006, and First Prize at the prestigious ARD Competition in Munich in September 2009, thus becoming the first harpist to obtain awards at three major international events. In 2010, Emmanuel Ceysson was nominated in the category ‘Solo Instrumental Discovery’ at the Victoires de la Musique Classique. In November 2011 he received a Prix d’Encouragement from the Académie des Beaux-Arts de l’Institut de France (Fondation Simone Del Duca) in recognition of his distinguished early career. A Naïve artist since January 2012, when he released a solo album based upon famous Opera themes. He was Visiting Professor at the Royal Academy of Music in London from 2005 to 2009 and has taught at the International Summer Academy in Nice since 2010. He has given recitals and educational residencies at venues including the Wolf Trap Foundation in Virginia, North Orange County Community Concerts Association in California, Macomb Center for the Performing Arts in Michigan, Mary Baldwin College in Virginia, the Washington Center for the Performing Arts (WA), and Emporia Arts Council in Kansas. His Chicago debut at Lyon & Healy Hall was sponsored by the Victor Salvi Foundation. Recent highlights include the concert at the Stefaniensaal of Graz and the Gstaad festival. The Kalamazoo Symphony Orchestra, conducted by Music Director Raymond Harvey, presents internationally renowned, Emmanuel Ceysson, for the third concert of its 2016-17 Symphonic Series. Billed the "enfant terrible" of the harp, Ceysson's virtuosity and infectious enthusiasm will be on full display in Glière's Harp Concerto. Maestro Harvey rounds out the program with the music of Pulitzer Prize winning composer John Corigliano and Felix Mendelssohn.